Minnesota Landscape Arboretum, features seasonal photos and monthly gardening tips. The 2017 edition offers special features, including water saving strategies for home lawns (with a step-by-step guide for irrigation systems) and a vegetable garden planting guide. Buy them for yourself and as gifts for favorite fellow gardeners in time for the holidays and the upcoming gardening year! Proceeds from the sale of the calendar support statewide horticulture outreach education. 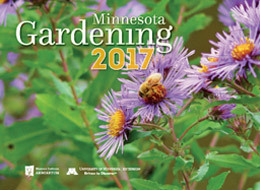 To order the calendar from the University of Minnesota Bookstore, visit http://z.umn.edu/gardencalendar. Receive a 10% discount by entering MG10 in the coupon code.